The square opened on 3rd March and by 5th April hackers had taken control of the two touchscreens to display content from pornographic website Pornhub, as reported on cnet. Over a period of two years, the government of Western Australia spent AU$73.5 million ($56.4 million) to build Yagan Square. “Yagan Square has two touchscreen wayfinding signs, one at each entrance of the William Street Mall,” a spokeswoman for the city’s Metropolitan Redevelopment Authority told the ABC. “Unfortunately, it appears that these screens were compromised this evening and, for a brief period of time, some inappropriate content was displayed on one of the screens. The story mirrors other incidents around the world regarding public displays being hacked, with pornographic material seemingly the content of choice. One of the most profile attacks took place on Union Station in Washington DC, when a large advertising display was hacked during rush hour to display pornographic content. James Keen, group marketing manager at video streaming and digital signage software provider Tripleplay, believes more focus on security is needed to avoid more serious attacks – rather than those that just cause a nuisance. “The cynic in me thinks the AV industry ignores security out of convenience, some because they don’t pay it enough attention, some because they can’t solve it and some because they don’t care enough. AV tech was generally seen as secure. It wasn’t networked, so there was no need to consider security. With the dawn of IP however that has dramatically changed. The world of online espionage, hacking, illegal streaming and, what I like to call, ‘digital graffiti’ has forced many AV technology companies to rethink; but not all. 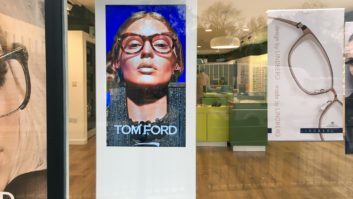 “We’ve seen a number of instances of window digital signage systems being hacked and displaying adult materials in public spaces, digital graffiti, which people understand; it’s a hack and a delinquent with a PC.